The ONLY website that offers the latest news about Vanessa-Mae! 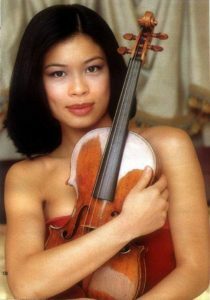 Vanessa-Mae calls her Guadagnini violin “Gizmo”. Why is that? Gizmo? You mean that cute thing from the movie ‘Gremlins’? While I could see Vanessa-Mae owning such a cute animal, the answer is ‘no’. “Gizmo” is the affectionate name she has given her violin, which was made by GIOVANNI BATTISTA GUADAGNINI in 1761. Why? Before we proceed, we should explore the wondrous instrument known as the violin. There are three things that fascinate me about the violin. First, close your eyes for a moment and use your imagination. The violin is some 300 years old, and yet the basic design remains the same. Can you think of any man-made invention that is so old but yet the design has not changed? I cannot! Secondly, for an object that is less than 15″ long and 6″ wide, it can fill an entire concert hall with no acoustical assistance. Thirdly, you can have a violinmaker (also referred to as ‘luthier’) make two violins from the same piece of wood at the same time. The two violins will NOT sound identical. The sound of a violin is as unique as the human fingerprint. This partially explains why certain antique violins made by famous luthiers (like Antonio Stradivari) are so highly prized and valued. They are simply irreplaceable! Some antique violins cost more than a mansion. Did you know that the most expensive violin in the world is NOT a Stradivarius (or Guadagnini)? Stradivari might be the most famous, but there are professional violinists who would argue that violins made by Giuseppe Guerneri Del Gesu easily matches the craftsmanship and the sound of Stradivari and Guaduagnini instruments. In fact, some might argue that his instruments are superior! Anne Akiko Meyers plays on one (“Ex-Vieuxtemps”), and was appraised for $16,000,000 as of 2013. That is not a misprint. The reason for the astronomical value for this particular instrument is its condition. Her violin was made in 1741. Any instrument that old usually have some body damage from accidents and wear. This meant cracks that requires sealant or replacement of the scroll/neck. Mrs. Meyers’ violin has no damage to it at all. The body of the violin is 100% original and without defect. Given the reputation of its maker, this violin is already an extremely rare find. Having it completely free of damage is almost unheard of! In case you’re wondering, the primary consensus is that the top 3 violinmakers from that era are Stradivari, Del Gesu, and Guadagnini. The short answer is “unlikely”. Even if you had the money, most of the prized instruments made by Stradivari, Del Gesu, and Guadagnini are in the hands of famous violinists. They either buy them for personal use or borrow them on loan for their lifetime use; others are in museums for display only. But fear not! The longstanding theory is that such instruments have a sound that is impossible to duplicate. In a sense, this is undoubtedly true. As discussed earlier, each violin has its own voice. From the cheapest violin that might cost you $90 on ebay, to a real Stradivarius violin; EVERY violin is unique. Surely, the prized violins that cost millions must have a sound that easily separates itself from modern violins. Would it surprise you to learn that the answer is ‘No’? A few years ago, there was a double blind test in France where the most respected violinists and violinmakers were invited to participate. All given instruments to play. The instruments included a mixture of real Strads, Del Gesu’s, and some modern instruments. The results were shocking! None of the violinists or violinmakers were consistently able to distinguish new from old. What’s also amazing is that some of the violinists own Strads themselves! Yet they were not able to consistently identify other Strads from modern violins made by today’s luthiers. You can watch the entire test on Youtube. With that in mind, why pay for a Stradivarius in the first place? Despite the findings, it’s still an incredibly rare find and holds a lot of sentimental value. Besides, just like with most expensive man-made things, you pay for the name above all else. This also means that you can find something comparable that doesn’t involve you winning the lottery. The key is knowing where to look. Most people interested in purchasing a violin do not have the ability to simply drive down to their local violin shop. Such a shop may not exist or there may be time constraints. Fortunately, reputable violin shops do exist online. Such shops usually allow you to try out their instruments with no obligation to buy. As I said in my bio, I wholeheartedly recommend Fiddlershop. Pierre Holstein owns the website linked, and you can check out his Youtube channel here. His family has a violin shop (along with guitars and mandolins) that operates out of Florida. In my opinion, they sell some of the best instruments you can buy under $5K. Pierre exhaustively tries out instruments from different workshops, and he will tell you that most do not simply cut it. He never badmouths the individual or company that makes them. He simply won’t carry their instruments. He has instruments for every level–from beginner to professional. Please, PLEASE never buy an instrument off of ebay! If you’re thinking of starting to learn the violin, there’s no worse way to impede your development by buying a cheaply made violin. Why? Cheaply made violins are very hard to play; way harder than it should be otherwise. It takes too much work to get a acceptable tone out of it. Because of this, beginners lose interest and stop playing. If you are serious about learning the violin, then expect to pay a few hundred bucks. Buying a $100 violin makes no more sense than buying a $100 car. Author BenPosted on September 14, 2016 December 13, 2017 Categories EditorialTags 1761, acoustic, gizmo, guadagnini, vanessa-mae, violin5 Comments on Vanessa-Mae calls her Guadagnini violin “Gizmo”. Why is that? picnic on Vanessa-Mae will perform at Budapest Arena in May! Michelle on Vanessa-Mae will perform at Budapest Arena in May! Martin on Interview with Vanessa-Mae reveals a painful rift she bears..
Ben on Vanessa-Mae calls her Guadagnini violin “Gizmo”. Why is that? 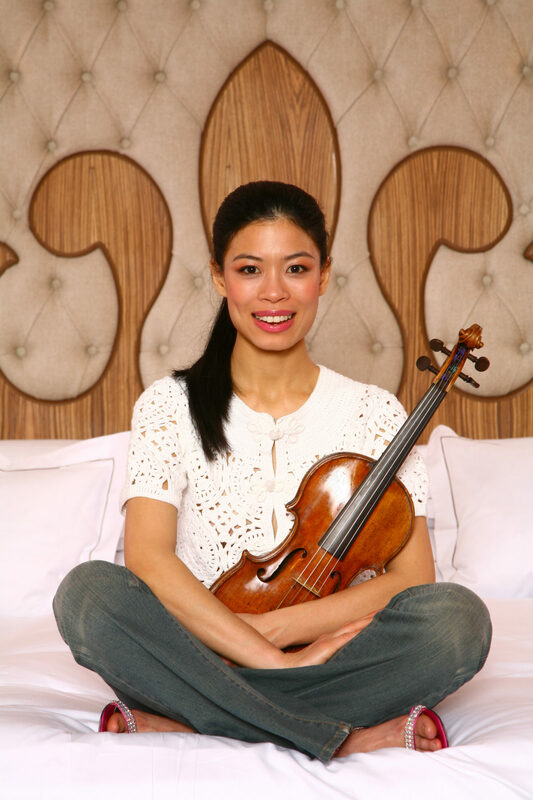 George Gregoire on Vanessa-Mae calls her Guadagnini violin “Gizmo”. Why is that?